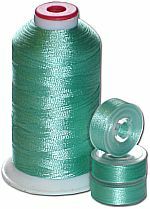 Each kit includes: 72 prewound bobbins and 10 1100-yard cones of strong 40wt poly thread, to match the quantity of bobbin thread. Top and bobbin thread are both in Jade DK color, and are made or premium quality long polyester fiber. 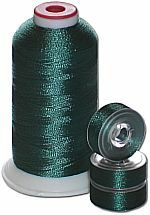 The bobbins include 60 wt thread, are L size, plastic sided. If you're not sure whether your machine accepts L size bobbins, just measure your original bobbin. If it's diameter is 0.8 inches (20 millimeters) and the height is 0.3 inches (7.5 millimeters), then your machine takes L size bobbins and you may safely buy this kit. Also, here is the list of embroidery machines sorted by the type of bobbins they use.